After a rather busy rest day with the visit to a vineyard, and the lunch on site, back to competition. Competitors were quite anxious at the 11.00 skippers’ meeting. There was no wind from the North, as usual. They were afraid there will be no wind in the afternoon. Luckily, an afternoon sea breeze got in and boat set sails.. Leaders on both Open and Mixed are still the same Dany Paschalidis and Petros Konstantinidis still have an excellent performance after scoring 2 more bullets today! Same for Estela Jentsch and Daniel Brown who stand 1st in the Mixed and 3rd in the overal ranking! After one hour of postponement ashore, the start of the 6th race took place with 10 to 12 knots of wind at 2.45 PM . It was a very clear start for GRE 1 who took the lead immediately after the start signal. She staied at the first place during the whole race. The boats trying to dispute GRE position were the German team. It was a beautiful “team race”, with GER 11, GER 211 and GER 44 respectively on GRE 1 back. Never succeeded. ITA 46 made a wrong choise during the first beat, and rounded mark No1 at the 12th place. Despite they sailed better afterwards, ITA finished 9, not a good result for them. 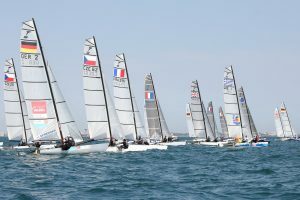 5’ after the finish of the last boat, a new starting sequence began, in lighter winds (8/10 knots). AUT 3, the mixed crew of Dietmar and Silvia Salzman was the first boat closest to the pin end. They managed to stop the other boats who tried to pass her to windward. 3 seconds before the starts AUT 3 beared off, and started at full speed. She keeped her position during the first lap long. 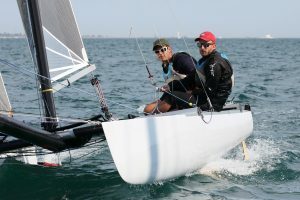 With a tactical sailing on the second beat, GRE 1 came again at the first place. Despite various maneuvers of AUT 3, GRE1 finished with a 28” gap ahead of AUT, who now stand 2nd in the Mixed Division. 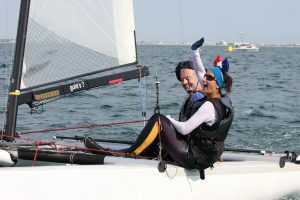 The 3rd place for the 7th race took another mixed crew, CZE 62, with Pavlis and Michaela Pavlisova. After a very good 6th place at the race before they now stand in 4th Mixed with equal points with Jürgen and Sarah Jentsch in 3rd. Tonight all crews will meet again for a dinner at the YCM around a local plate of fish. Saturday, last day of racing, 2 races are scheduled. The skippers’ meeting will be much earlier than the day before: 09.00. Aiming at a start at 10.00..